I did a trial run last night with the cups and love it. 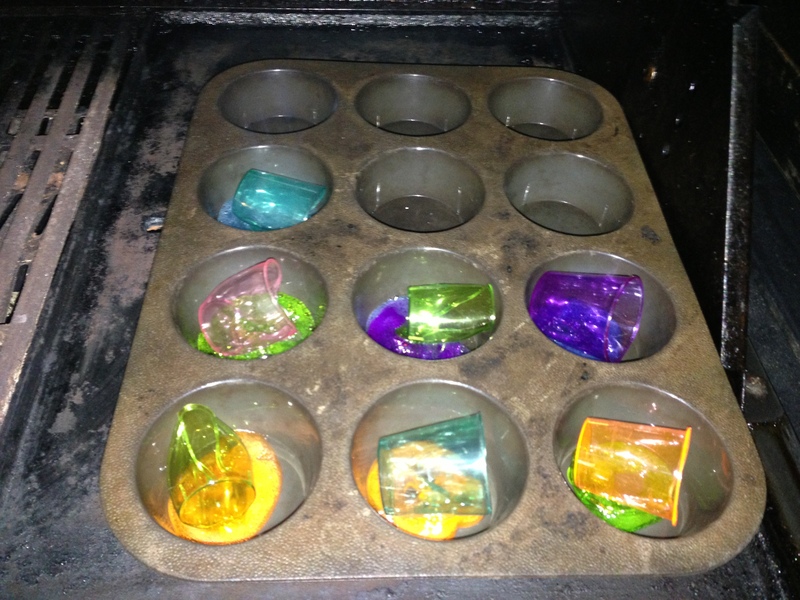 Excited to get home this afternoon and cook shot glasses lol. Question – I have the ring but what did you use to hang it? It looks like ribbon in the pics. Just what I was looking for! Even before I read the post I laughed aloud at your mission statement! Wonderful! Thanks for doing all the experimentation. 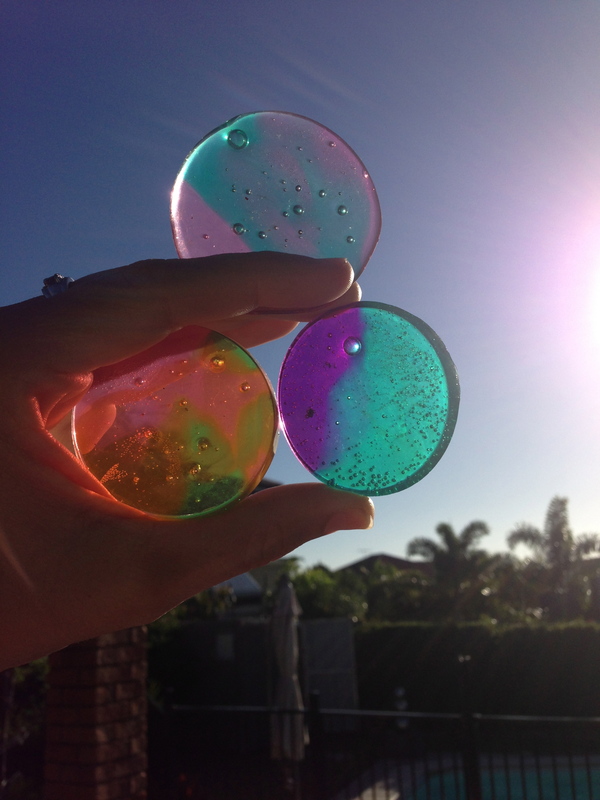 The plastic blobs are actually very pretty and could be used as beads! Well done! I love your project. How did you manage to get it to balance so well? So the hoop is horizontal. I made a suncatcher with 4 evenly spaced strands (without the melted discs) and I couldn’t get it to balance to save my life! It tipped every which way! Do you put anything in the muffin tins to keep it from sticking? Looks beautiful. How long does it take to melt the fully on the grill? Hi Karen, thank you. To be honest this was quite a few years ago now so I don’t recall exactly, but I think around 20 minutes. How long does it take for them to completely melt on the grill? Very creative! I love windchimes and this is the prettiest I’ve ever seen.I want to try this.What size cup is suppose to be used,instead of shot glasses? Did you add food coloring to give the cup disc such a beautiful hue? Hi. You would just need to experiment with different sized cups if you can’t get your hands on the shot glasses. They are already coloured so no extra colouring required. You got my creative juices flowing. Love this idea! I will be looking for the plastic shot glasses. The comments and answers were quite helpful. please tell me where you got the metal hoop as i cant find any? Are the fumes really toxic? I just found som plastic glasses I can use. Also the glasses I found are a little larger. Can I break them up a bit and then melt them? Some people have had luck using a portable electric grill if that is an option at all. 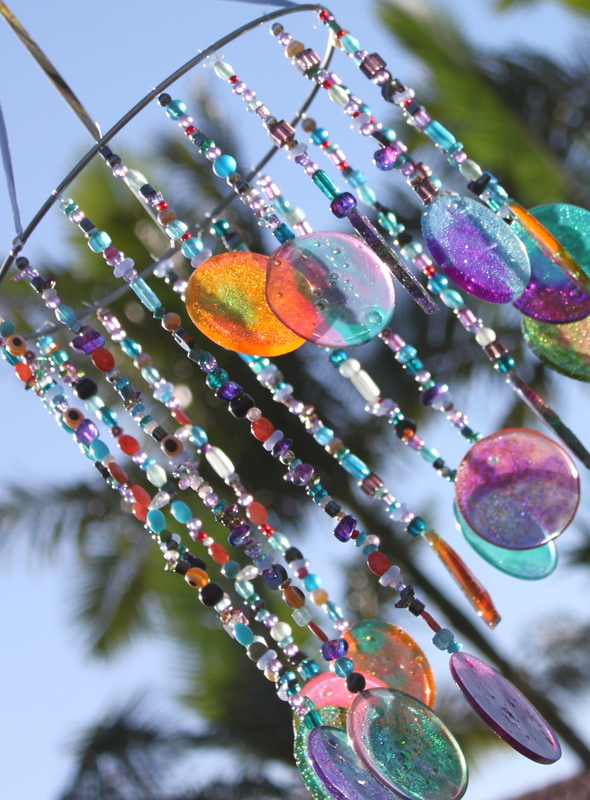 Love this idea, I’m playing with all sorts of wind chimes and hangings and the moment – to the extent my adult daughters laugh at my ardent collection of nice shaped sticks! One thing – what size ring did you use? It’s hard to gauge by the pic.